Order Solomon Grundy Chardonnay Wine Kit 30 bottle from the Stirling Homebrew Shop UK. 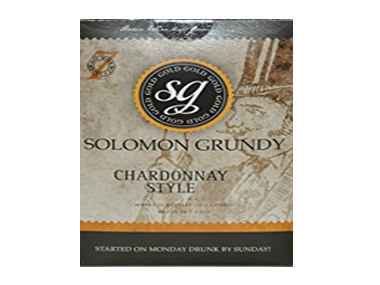 Buy Solomon Grundy Chardonnay Wine Kit - 30 bottle and other Wine Kits safely online in the UK. This wine kit makes 30 bottles of homemade wine in just 7 days! Where to buy Solomon Grundy Chardonnay Wine Kit 30 bottle safely online? Shop at the Stirling Homebrew Shop if you are wondering where you can buy Solomon Grundy Chardonnay Wine Kit - 30 bottle safely online in the United Kingdom. Chardonnay Wine Kit 30 bottle - Solomon Grundy Chardonnay Wine Kit - 30 bottle in Wine Kits and Homebrew.